9 Tips to Pick the Ideal Coffee Table for Your Living! The living room looks empty without its centre or coffee table. There are several things to keep in mind when you are picking the centre or coffee table for your living. You have to first think about what you need your table to do for you. Know what your room is missing, like from completing a look, to storage & display that is required in your living space & then pick a table that provides the overall solution. Usually, the centre or coffee table needs to hold the books, magazines, newspaper, TV/AC remote, food, drinks, games, etc. Sometimes you might want to put your feet-up on it, or the kids might need a place for drawing. Plus it is exactly in the middle of the room, where you can’t miss it, so you have to make sure that it’s a good one! The ideal coffee table anchors the furniture in a room by filling in the gap, & providing enough space around it for the movement or for some simple leg stretching. If your seating area is larger, you can create two or more centre points. While selecting centre or coffee table many questions come-up in your mind like…Which style will work for your room? Should you go with a wood one with thick legs or a metallic with the glass on top; should it be square, round or rectangular? Options are endless & at times can be overwhelming. Must Read: 13 Tips To Design a Living Room in Your Home! The price for the centre or coffee table can range from ultra-expensive to budget friendly, so before you start shopping know what you have to spend on it! The overall budget of a living room is broken down to into areas such as lighting, accessories & furniture. The furniture item includes the sofa, chairs, side tables & centre or coffee table, with a larger portion allocated to the bigger pieces. The good news is that you can bend a little on your budget if you see something you like as long as it does not compromise the quality of sofas or chairs. Also Read: 9Tips to Buy Furniture for Your Home! When you layout the plan for your living room, think about the best shape for space. The shape of your sofa is the biggest clue on which the shape of your living room center table or coffee table can be decided! The rectangular sofa or an L-shaped lounge usually demands the rectangle table so that the food or any other items can place on it, & can be easily reached by the people sitting at the far ends. Similarly, for the smaller sofas which have the square seating area can go for a square or round table. You can also break the monotony of the square & rectangle table by choosing oval or circular shapes. Note: If you have a children or pets, round or oval centre table is ideal, as the sharp corner invites injuries if one falls or bumps into it. As with the shape, you will need to determine the size you need. The height of a centre table is important, as it should not be lower than 1 or 2 inches from the seat of your couch. The table should be smaller than two-third of the largest piece of seating in a living room. It should have enough space for showpieces & everyday objects like coffee/tea mugs, laptop, newspapers, magazines, etc. The standard coffee table height should be of the same height of sofa or a couple of inches lower than that of the sofa for ease of access. The standard coffee table height is about 16 or 18 inches & pairs well with the typically sized couch. An optimal distance between living room center table & other furniture is preferred as 18 inches. The Styles to be considered while purchasing you centre table can be modern, contemporary, vintage, traditional, etc. There are many styles to choose from. You just have to use the decorating scheme of your room as your guide! As your coffee table will be the focal point of all eyes, so the safest option would be that the table is in tune with the colours, textures, patterns or materials used in the room. For example, a traditional living room can pull off a classic, elegant wooden centre piece with ease. While edgy, geometric tables, a sleek metal table with a glass top belongs to contemporary spaces. If country casual is more your like, then the rustic oak table would be perfect. The scale is also important when it comes to styling. It is simply about the size & visual weight of objects in a room being comparable. Striking tables pairs well with slim sofas. They help to ground the space in large rooms with high ceilings or lots of windows. On the other hand, the smaller setup can pull off the delicate metal & glass designs. The living room center table with glass top create the illusion of depth, making the overall setup look roomy & bigger than what it is. They are more preferable for small livings, & can also be used to show off a lavish, solid-coloured couch behind or the stylish rug below. Another important factor is to know what the primary use will be? Will the table be more decorative, or provide storage? You can customise your living room center table according to what activity you usually carry out around it. If you entertain guests often choose tables with a bordered edge or rough surface, so you do not have to worry about tripping over & spilling of drinks or food. You should pick a piece that holds drinks & snack plates with ease. If décor is more the purpose, you can focus on one with lines & texture in a material you love. For small space, you can choose a center rectangle table that comes with a lower open shelf or drawers for storage where you can store anything like any stationery items, magazines, napkins, newspaper, game boards, remote controls, etc. Also Read: All You Know About Living Room & its Furniture! When you shop for a living room center table or coffee table, you will become aware of how many choices you have when it comes to the material. The most obvious material that comes into mind is the wood, but you don’t have to restrict yourself to wood if you don’t want to, as there are many other options available in the market! Take a look at your room & other furniture to determine what material would look the best! If your Living room is too small, then the clear acrylic & glass can make the room look more open. Materials such as glass combined with metal frames offer the more sophisticated look & provide strength to the coffee tables. They are less bulky than wood & are easier to clean and move both. Darker wood, such as mahogany or walnut, or the materials such as marble & metal can look good in a traditional room. You can also use tables made of medium density fibreboard (MDF) when the budget is the main priority. 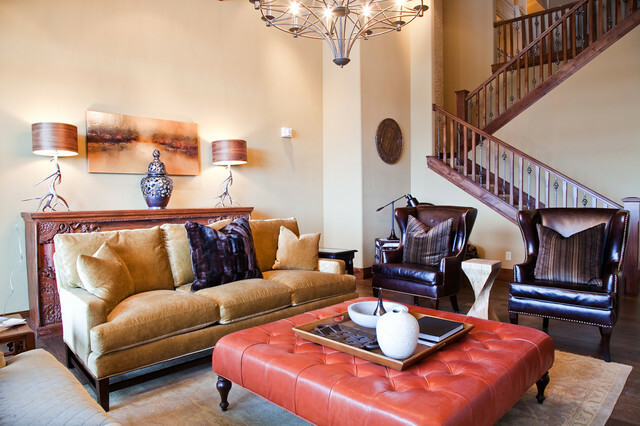 Leather or faux leather can also work well in a variety of settings & they are also easy to maintain. When you have small children in a house, consider the safety & durability of the material. At the end when it comes to choosing the material it should be easy to maintain & stable! Who says you need to use only one table? 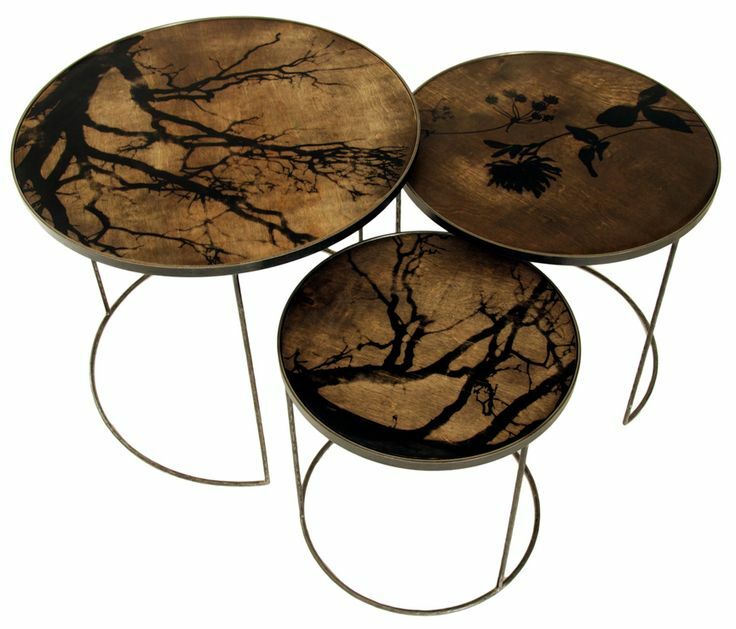 You can try the collection of tables for your living. For an interesting look, you can place the two or three of identical tables of different sizes & pull out each table to expand the surface area while staggering the table tops too. If your space is wide, you can also place two tables next to each other & create the one larger table. The another option is to select the several garden stools & use them as a sofa table solution. They are available in a variety of colours & patterns that look perfect in a bright sunny living room. Sometimes thinking outside the box allows you to find the perfect & unique centre or coffee table, which sometimes don’t look like a coffee table! The old steamer trunks, cedar chests & ottomans are fabulous alternatives for the typical centre or coffee table. Each option offers its own eclectic appeal! For instance, Ottomans made of leather or beautiful fabrics will add some additional visual interest & texture to your living room. They can also serve as a place to put your feet up without concern for the tabletop. You can also use the old wooden trunk or box by rejuvenating it as unique centre piece nostalgically in your family room creating an interesting conversation piece, which can also be used as a hidden storage! Also Read: 12 Steps to Rejuvenate the Old Box From Your Junkyard! After you decide the budget, determine your style, functionality, size & material. It’s a time to shop. For that, you should know the measurements of the room, the space available in front of the sofa, height of sofa & images of other furnishings. These will help you to pick something that is to scale, matching in style & perfect for your room. With these above-given factors, we assure that you will be able to select the right centre or coffee table that will match your space & aesthetic without any difficulty! 14 Innovation Ideas to Make Feel Small Living Room Bigger!